This time with a t-shirt waistband, and in bright, springy colors! I think the ideal fabric for a skirt like this would be a light-weight jersey, or other no-fray fabric. The hemming is the longest part of this project! On the other hand, the pretty spring prints(Thanks, Kathleen!) just might be worth it. *The measurements given in this tutorial are for a just-below-the-knee length skirt, so feel free to adjust for your own preferences! 1) To start, make a t-shirt waistband by cutting about 6" off the bottom of a t-shirt, and wrapping it around yourself, pulling it nice and snug, and marking with pins. 3) And cut a length of stretchy knit fabric for your underskirt. It should be 1.5x your hip measurement, and your desired length. (Mine was 23" long) Sew the sides together, and sew a gathering stitch (straight stitch on longest length) around the top. 4) Cut 5 strips of fabric, 5.5" wide. The first strip should be 1.5x your hip measurement in length, and the other four about 2 times your hip measurement. 5) Fold over each side of your strips about 1/4" and press(optional). Sew a gathering stitch on one of the sides and hem the other, them sew the short sides together to make a circle. Repeat for all your strips. 6) Gather your underskirt and first strip to the same size as your waistband. 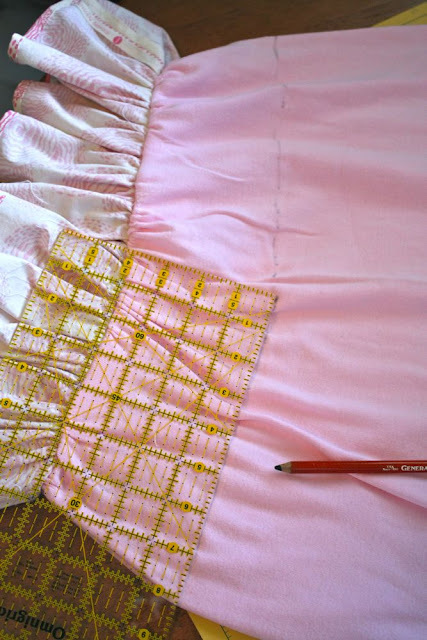 7) Set the gathered strip inside the underskirt so that the tops meet. The wrong side of the strip should be facing the right side of your underskirt. 9) Turn the whole skirt right side out, and fold the top of the waistband down so that the right side is facing outward. 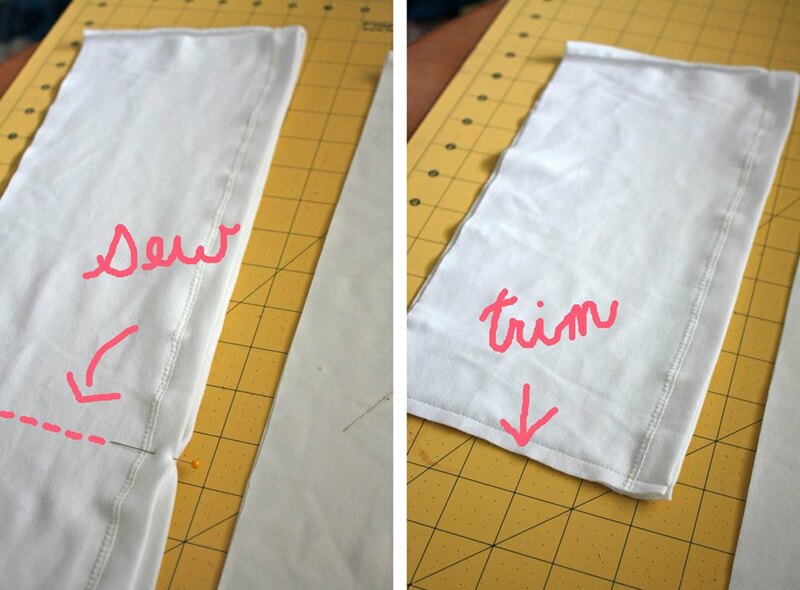 10) Sew the waistband on with a zig-zag stitch, removing the pins underneath as you go. Try to match your stitches with the shirt hem stitches that are already there. I'm sorry it took a while to crank this tutorial out-it was a total Murphy's Law project! My first try was so bad, I had to totally scrap it, which I almost never do! It's amazing how doing a tutorial for something makes it so much harder. :o) I hope you're able to use it, though! It's such a fun style! That is so cute! I'm def gonna try this. This is such an adorable idea! I think I need to make one for myself and each of my daughters. Oh this is lovely! And it doesn't seem difficult to make...of course that's because it's YOU! It looks so good on you. I love it with the pink sweater! It's adorable and even more so on you. That is a PRECIOUS skirt. I sure hope you'll be making more and selling them... big hint. I've made these for my daughter and customers but never me??? You look so springy & cute! LOVE it! So pretty! I'm gonna make one for me and my daughter! I will put it on my list of things to do, Thanks! I like the T-shirt waist band idea. Thanks Disney. I think I may have to whip one of these up for myself using some scraps I need to be rid of...and if I can do one for my daughter too so we match that would be darling! Love your top with this, I'm drooling big time over that. Loooooove it!! I'll try to make one! So pretty!! Thanks for a great tut, you make it look so easy! May I add it to my fav tutorials on my blog? Let me know, thanks! YEAH! The long awaited ruffle skirt with tshirt waistband! Awesome job! I totally need one for spring! Yippee I have a project to work on this week! Really cute!! Love the black one!! Thank you, Disney, for your generous spirit in sharing your talents. I know this takes a lot of time, and I so appreciate it!! This is adorable as are all of your posts!! You are truly a Proverbs 31 kind of gal! Bless you! Sandra: of course you may! I love it! thank you so much! I have a question though, I have a gathering foot on my machine that just gathers as I sew if i use the highest tension setting and longest stitch setting...can I do this? Or should I do it by hand? You always make everything seem so easy! And you look adorable. Such a pretty, happy skirt! LOVE IT!! I am going to make at least one for my college aged daughter. I think she will love it! One question - do you stretch the t-shirt or underskirt at all when sewing on the ruffles??? Emily: I've never used a ruffler foot before (except in my dreams! ), but I can only assume it would work just fine! CJ: No, you don't need to stretch the knit as you sew, the zig-zag stitch will allow the fabric to stretch with you! I really want to make this. It's so pretty. Thanks! This turned out so stinking cute! I have got to try this for sure!! I´ve been looking for such a tut since you posted the first skirt.. But none have been so perfect. Those fabrics are just awsomeee!!!! Once again, thanks for all the efforts you put into this. I think I might have to convince my baby to have a very long nap or two today so I can have a go at this!!! Wow, that looks amazing! When I first saw it I thought it was store bought. I'm a pretty basic seamstress (translation: I sew doll clothes by hand) so it might take me a while to be able to sew that and actually be able to wear it out, but it's too pretty to pass up. Once again I´m in a better mood just because I decided to look at your blog when I should be doing the laundry! And thanks to you my sewing machine is back on the kitchen table and will hopefully be used again soon! Probably for this skirt! Just have to decide if I´ll make one for me or my 5 yr old first!! This is so springy!! I want to know who takes your pictures, and where do you find all those wonderfully interesting places to take them? The Amy Butler material looks so pretty made up into that skirt. I am glad that you could use it:) Thanks for the tutorial--I am thinking my girlie girls will love one of those skirts. I LOOOVE this skirt!!! so beautiful. I will definitely be making this!! This is a beautiful skirt! And oh my gosh you are just too pretty, thanks for sharing, I might try this ! Sooo cute! I love the combinations of fabrics, very fun and pretty!! Where did you get the cardigan? Oh gosh! You are brilliant! Disney, could you be any sweeter?! I love looking at these pictures alone! Question: was your pink stretchy knit fabric also a t-shirt? If not, could it be? Thanks! i luv it! super duper cute, cute, cute! gotta know where your shirt is from though... luv that too! LauraBell: My underskirt was knit by-the-yard, but if your t-shirt was big enough it would work! 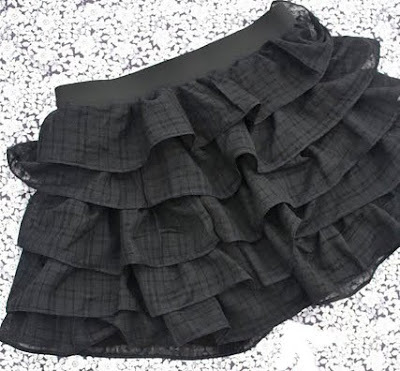 Anon: the black skirt was 13" long, with 4" ruffles, 2.5" apart, if I remember correctly! You are so stinkin' cute. I've never had a desire to sew until I started following your blog. 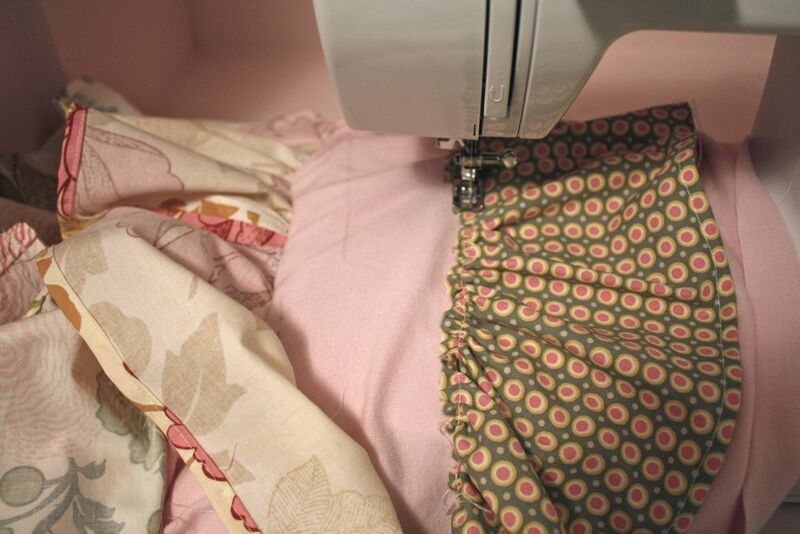 Do you have any tips for a first-timer wanting to get into sewing? I don't know if I should I take a class or buy a cheap machine... I seriously don't know anything about sewing. Can you please make me a whole new wardrobe? Love it. You're in the link luv roundup today, not once, but twice!!! I love this skirt! I would love to sponsor a give a way for your blog! Just let me know what you like! Amanda: For a first-time sewer a cheap machine would be just fine! You could even check Craigslist or something for a used one. I would first ask around if anyone you know sews and can teach you, that's the best way to learn! But if not, a class would probably give you a lot of confidence! JoAnn's offers free classes when you buy a machine from them, or at least they did a couple of years ago! Good luck! Has the elastic I sent got there yet? Love it! It looks as comfy as it is cute! You have got to be the most brilliant, rufflle-tastic girl I know in blogland. LOVE this tutorial, I've been a long time follower, and just couldn't keep the silence any longer! You are darling....thank you! love it! the funny thing is that I have always wanted to know how to sew that type of waistband. i feel silly now that i know how simple it is to make. Ooooohhhh I was so excited for this one back when you posted the black one! I know what I'll be doing tomorrow! Thank you so much for your time and effort Disney! Ever since I "discovered" your blog I have had the uncontrollable urge to put ruffles on EVERYTHING, so I guess we are kindred spirits! I'm so glad you have the patience to do tutorials--because although I love to sew, I never break it down into step-by-step processes with pics...and I sort of fly by the saying "it doesn't have to be perfect to be beautiful!" haha anyways--thanks for your beautiful posts that inspire me! Oh brilliant! Thank you so much! I can't wait to try it! I made one of these for my daughters when I first starting blogging out of the exact same fabrics! I love that pink and moss green together! Beautiful! Both you and the skirt! Wow, that skirt is so pretty! oooooooooooh I love this! off to create! thanks! Love this is the springy colors! 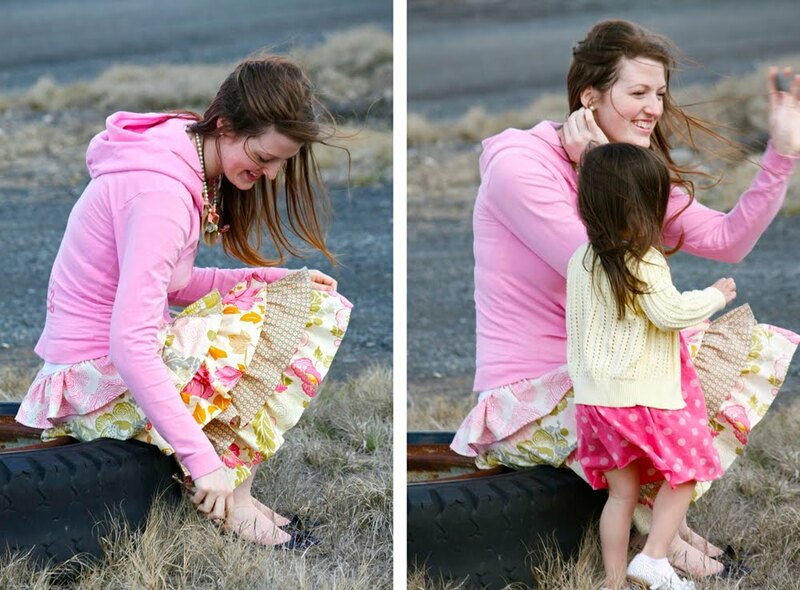 Such wonderful easy to sew skirts. I think I will have to try it to. seriously?? i would pay good money for that adorable piece of work. you are so good i cant believe it! do you sell your work ever??!! I have finally got round to starting this skirt, but I have a hiccup at the first hurdle!!! The stretchy fabric I have for the underskirt bit comes as a tube, but it's not quite 1.5x my hip measurement - does this matter?! I linked this on my blog! I love the spring colors. Gorgeous, thanks so much for the instructions! I have two of those fold over knit skirts from Old Navy that I am tired of, so I will just use those as and underskirt, keep the fold over waistband, and put the ruffles on those. They will be great for maternity then and far more interesting than a plain old knit skirt. 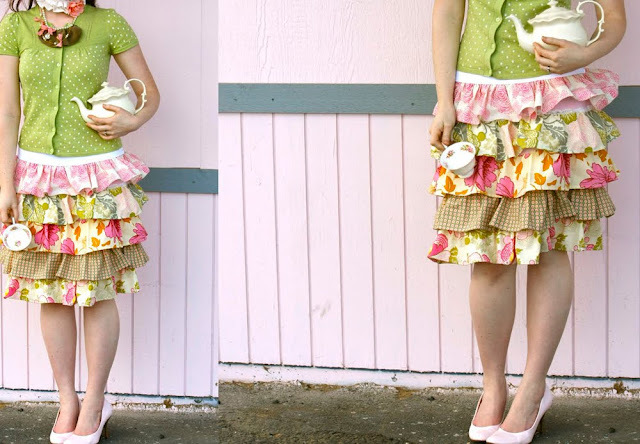 I love this skirt, its totally adorable and I want it :) I wrote in my blog about your blog and added pictures from 2 skirts that I loved. I hope that you don't mind. I have a quick question-- how much should I gather the last 4 ruffles? Do I gather them to match the waistband (ie. the same as I gathered the first ruffle?) Thanks!! It may be easier to mark the underskirt while it's flat, rather than waiting til step 11. With all the lines marked, one can speed right along with the ruffling! This is so cute and I love all the different colors and patterns you used. Great job! Our readers love your site! 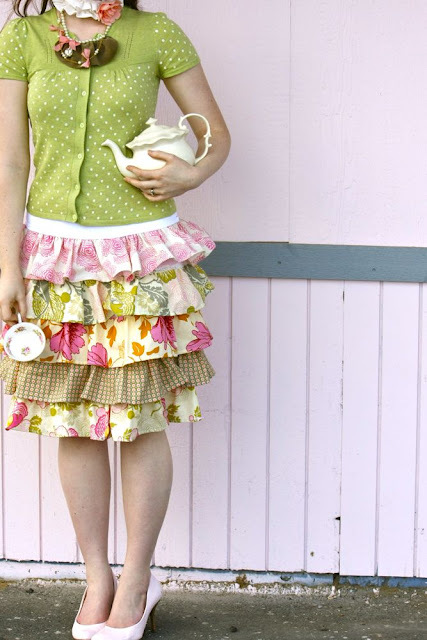 Cutesy skirt I think I have ever seen. Really glad I found this. I am making one tomorrow and am excited. Thank you so much for this tutorial. You can't find something this cute where I live. Coming late to the party....Thank you for this very nice tutorial - my daughter wants a ruffly skirt, and this looks like just the thing. Thanks for the inspiration! I made my skirt for easter and it turned out really cute! I loved it!!! It turned out great! 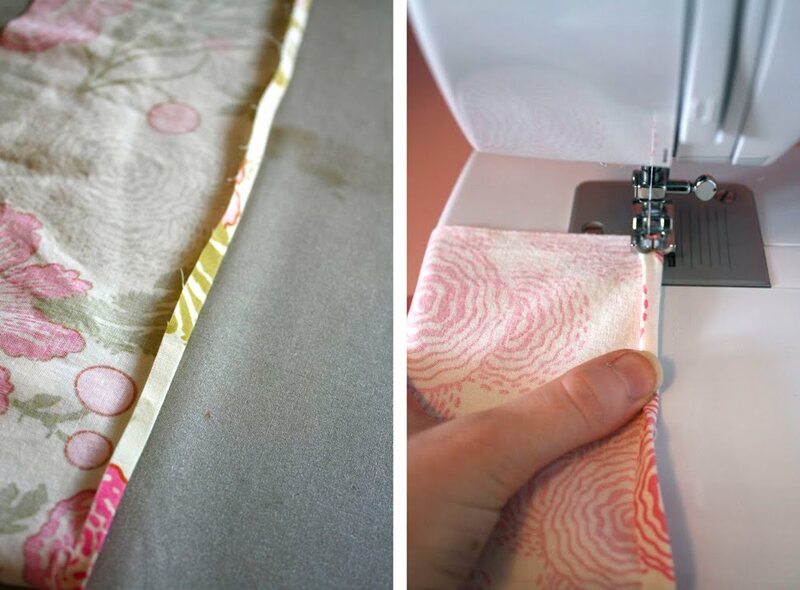 Why not just use a serger and do a rolled hem on all the layers? Love it! Thank you for coming up with the magical formula. I have wanted to make a few and just haven't wanted to figure that part out. I love the fabric combo! Very inspiring! Time to sew one! Looks so easy, the materials out just need to get the machine out later. Also think the t shirt waistbands a great idea, saves messing with zips etc. Many thank's for your tutorial.I can see myself making lots of them as i live in a hot climate and are ideal. I tried it and mine turned perfectly! Thanks for the tutorial! I plan on making several more. Thanks for this detailed and easy-to-follow tutorial. I do have lots of fabric and old clothes that I've "hoarded". Anywho, these instructions were simple and I was successful. I made my skirt using hot orange jersey and an old yellow tee for the waistband. It didnt come out perfect but its good enough. I will definitely use your tutorial to make better skirts for the summer. I dont have a blog to link to. I just completed this skirt for my 10yo daughter, and she loves it! A $4 Kmart t-shirt was the underskirt, and the ruffles were from a bulk buy of fabric scraps from a Vinnies store. And, just to shatter any preconceived stereotypes, I'm a dad, and have re-defined my sewing machine as a "power tool", so it's OK for me to use it! This will probably be the only ruffled sewing I'll do by hand, as this project convinced me that I needed to buy a ruffling foot. Thanks you for the great tutorial! I had a pair of old jeans and made the ruffles out of the legs. Love the skirt.